In line with the festival’s inclusivity theme of You, Me + The Arts, the event will see the birth of original compositions on social as well as community issues and causes. Twelve (12) singer-songwriters will be paired up to write 12 brand new songs in 12 hours on issues affecting the society that they feel and care about. “Think speed dating, singer-songwriter style,” says co-producer of the show, Ian Chow. “Unlike speed dating, the singer-songwriters have no choice but to make it work whether sparks fly or not because they have to premiere these new numbers to an actual audience when the 12 hours are up. And if that is not nerve-wrecking enough, it will be recorded live and made into a CD,” he adds. The eclectic line up is as interesting as the challenge. Singer-songwriters Aina Abdul, Brendan de Cruz, Beverly Matujal, Dickson Chai, Endee Ahmad, Fuad of Kyoto Protocol, Isaac Ho, Melissa Toh, Nick Davis, Otam, Priscillia Xavier and duo Shir Ling & Jacq Teng are ready to put their game face on. YSDAF 2018’s theme is all about people – how does the arts relate to people and vice versa. In an effort to be more inclusive and to expand its reach, YSDAF will be spreading its wings to work with people in different communities such as the disabled, the underprivileged, schools and others. This is an extension of YSD’s work under its Community & Health Pillar. “…And the Curtain Rises” is part of a string of satellite events leading up to the 2-day festival in August. Others satellite events include an outreach drama programme, a battle of bands and an art installation. Co-producer Coebar Abel reminds that the purpose of the singer-songwriter camp is to promote original content, encourage collaborations and showcase diverse talented local singer-songwriters. “We are also using the songs to raise awareness on issues that are around us but not necessarily part of us. We would like the audience to go home with empathy on the plight of the different communities and societal challenges faced in the country,” he says, adding that the recording will be given away to the early birds at the festival finale in August. Yayasan Sime Darby Chief Executive Officer Puan Hajjah Yatela Zainal Abidin said the singer – songwriter camp is a novel initiative that will enable Malaysians to learn about social and community issues, from a very engaging and personal perspective, through the captivating art of music. “Our goal at YSDAF2018 is to use the arts as a fun learning platform for Malaysians to be aware about important issues in communities and the society, and the singer-songwriter camp will be doing just that. By using songs to tell stories about people who need to be heard but are rarely given the opportunity, we are facilitating Malaysians to feel what they feel and know their innermost thoughts,” she said. “We hope to touch Malaysians with art, an alternative medium of knowledge, to make a much more sustainable impact,” she added. 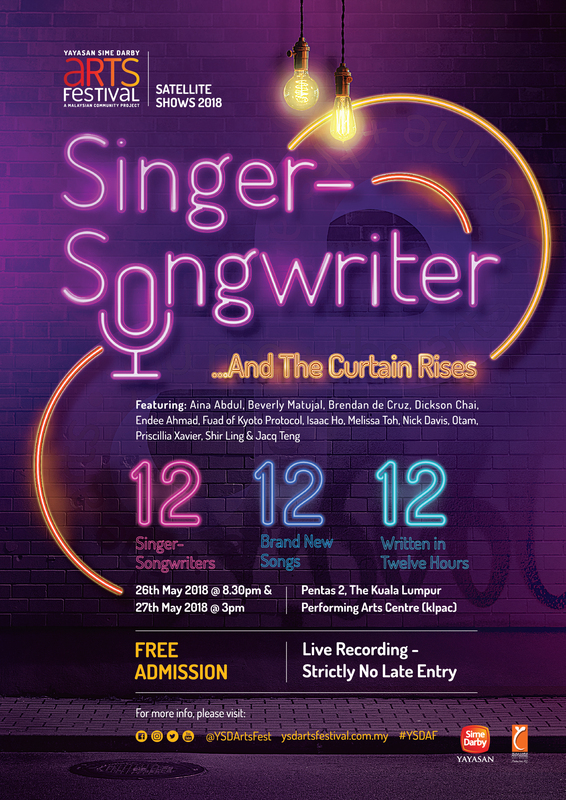 The songs will premiere at “…And the Curtain Rises” from 26 to 27 May at klpac’s Pentas 2. Admission is free. Yayasan Sime Darby Yayasan Sime Darby, or Sime Darby Foundation, was established in 1982 and is the philanthropic arm of Sime Darby Plantation Berhad, Sime Darby Property Berhad and Sime Darby Berhad. The objectives of Yayasan Sime Darby are supported by its five pillars, namely: education; environment; community & health; youth & sports; arts & culture. While led by independent members of a Governing Council and managed by a dedicated team, Yayasan Sime Darby works closely with Sime Darby Plantation Berhad, Sime Darby Property Berhad and Sime Darby Berhad in areas of mutual interest. Since its inception, Yayasan Sime Darby has awarded scholarships worth RM263.7 million to 3,692 students both in and outside Malaysia. It is supporting long term research projects of significant scientific value like the Stability of Altered Forest Ecosystems (SAFE) project which is the world’s largest ecological project, and the Reforestation and Rehabilitation of Orangutan Habitats in Northern Ulu Segama. Yayasan Sime Darby is also actively involved in the development and improvement of sports in Malaysia namely track cycling, sailing and golf. Under its community & health pillar, Yayasan Sime Darby supports initiatives to promote the well-being of disadvantaged people irrespective of race, culture, religion, creed or gender and works with established organisations to promote the development of arts & culture. The Kuala Lumpur Performing Arts Centre (klpac) Opened in May 2005, klpac is Malaysia’s only fully-integrated performing arts centre. A nonprofit organisation, it aims to nurture and develop the performing arts in Malaysia. Since its opening, klpac has housed almost 2,000 performances, film screenings, art exhibitions and events that has attracted more than half a million audiences. The Actors Studio Academy housed in klpac conducts a wide range of courses and runs a crucial community outreach programme that has benefited over 6,000 individuals. Other educational initiatives include the klpac Orchestra, klpac Symphonic Band, klpac String Orchestra, the Theatre for Young People (T4YP) programme and an Artist-in-Residence programme. For more information, please visit www.klpac.org.